See what people are saying about Your REALTORS® of Choice Patsy and Buzzy Wagenfuehr. This is what #TheBuzzOnLakeMartin is all about! Buzzy recently helped my husband and I find our dream vacation home. He really listened to what we were looking for and provided us with several options to choose from. During the purchase process, Buzzy was there to walk us through each step of the process. I really feel like he went above and beyond to make sure the purchase went smoothly. I would highly recommend Buzzy to anyone buying or selling a home. Patsy has a passion for helping people. Knowing that buying or selling real estate can be emotional, stressful and confusing, Patsy’s real estate expertise and understanding turns the challenge into a rewarding and fun process. 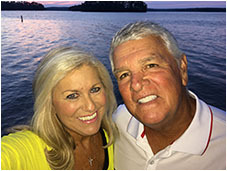 My wife and I had the pleasure of meeting and working with Patsy during our search for a lake home on Lake Martin. She is not you average real estate agent. Her professional demeanor drives her to always go above and beyond when preparing for your visits. She is not high pressure and is always willing to work within your schedule. She truly seeks to understand your real estate expectations and with her extensive knowledge of the lake she can easily identify and show you appropriate properties which meet your requirements. We really enjoyed working with her and highly recommend her for any of your real estate needs. She is our preferred realtor for any future real estate desires.